Choosing today’s outfit: it’s as simple as a song you sing to yourself. 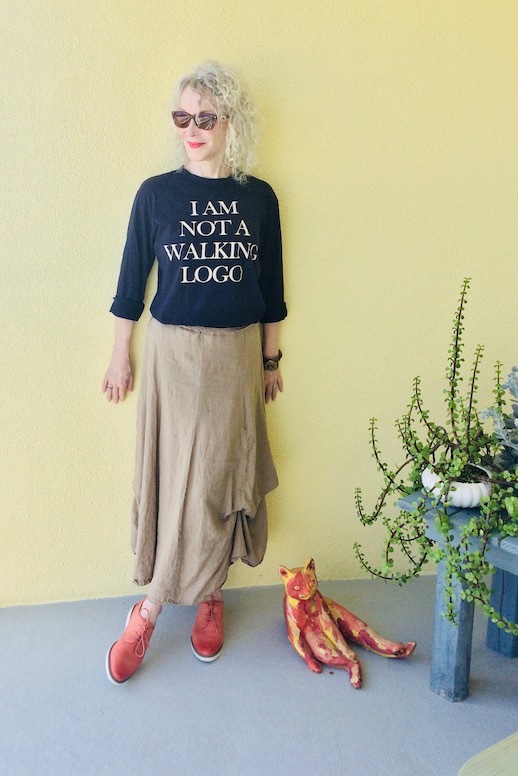 Something like this: “My personal style is all that, naturally, and I describe it as this and this and this.” You can sing it to the tune of the Muffin Top Song.The this’s are your style descriptors, the words that tell your style story, the ones that capture your fashion vibe. They’re the message you want to send, the way you want to be seen. It requires that you know yourself, and you’re probably over age 30, and have given some thought to your wardrobe. It’s the Three Word Rule in action. “One simple way to plan your outfits: Use the three-word rule. When you’re feeling uninspired, think of the words that define your personal style, and let it influence the pieces you choose.” Source. Here are some other style descriptors I came up with: neutral, dressy, girly, alternative, retro, boho, casual, whimsical, structured, urban, artistic, refined, funky, romantic, modest, relaxed, androgynous, playful, tomboy. I’m sure there are lots more; please tell me about yours in the comments. It’s true that we all have a range of styles: we may want bold one day and tailored neutrals the next. But I believe we have a touchstone style that we see as the most authentic “us”. Sometimes you see a look and say, “Oh that’s so Sherry” (or any friend) because it captures their essential style. Moi, I am mostly a feminine, modern, casual dresser, with streaks of funky and downtown. 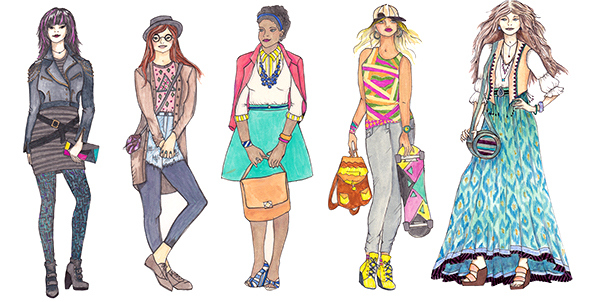 The gorgeous women of Visible Monday express their authenticity with their essential style choices. Example #1: Jill of Grownup Style is the picture of Refined, Sophisticated, and Bold (with some Edgy – check those sunglasses), IMHO. She knows what she loves and consistently presents this confident image. A bold, beautiful haori goes over Jill’s refined black, structured skirt and top. Example #2: Tiina of Elegance Revisited looks Clean, Straightforward, and adds Playful with her accessories. Tiina has often written that her core wardrobe is minimal, and she uses the extras to add color and texture. 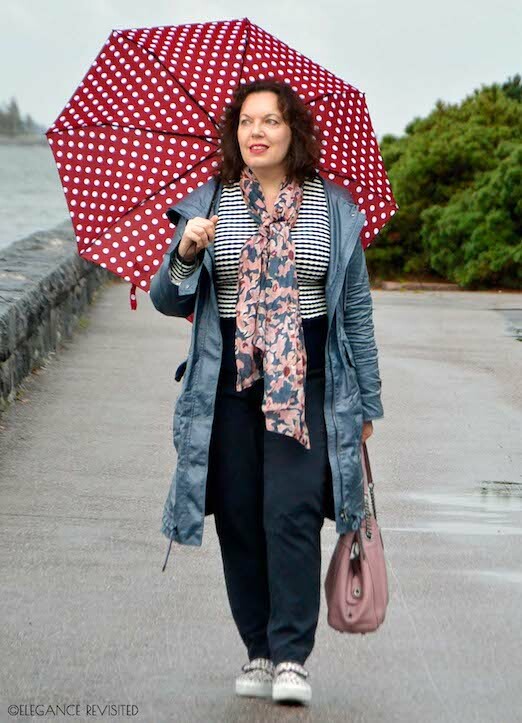 Love the polka-dot umbrella! And pale pink purse. 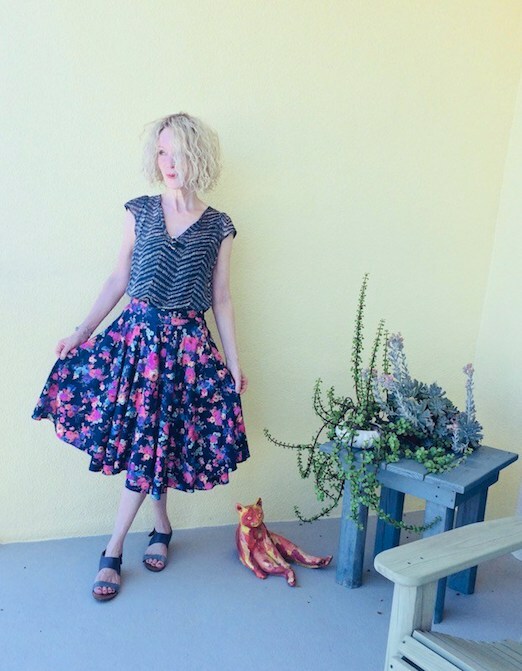 For this week’s Visible Monday look I leaned toward Feminine, Relaxed, Modern. On another Visible Monday I was Quirky, Downtown and yet again, Relaxed. Hmmm, relaxed appeals to me . . . Please be aware that links to vendors may be affiliate links. I may benefit from your purchases through the links on the blog. Header image via this site. Thanks so much for including me here Patti. I totally agree that even though we play with different looks , we do remain true to our own core style. I think this really comes as we age and are confident in ourselves. I didnt know the tune but it is a catchy tune to remember. It’s amazing how our clothes can showcase our personality this way!! 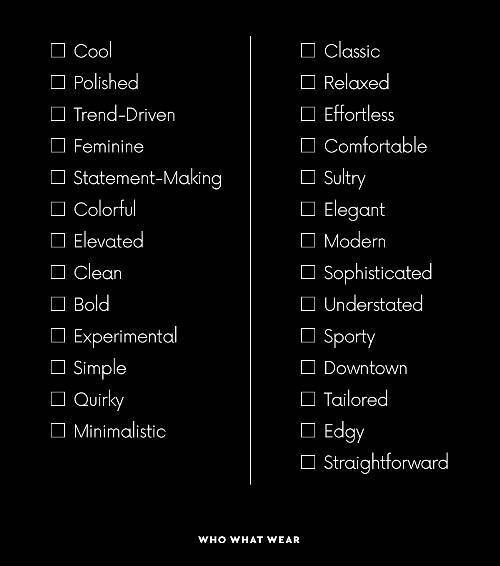 I’ve been trying to go with a little more edge lately..
what a fab post!, I agree that picking some words to describe your style can boost your inspiration and comfidence when feeling blah! Love those inspired ladies that you’ve linked. And obviously You Rock. Relaxed is a fabulous style! That is a great shot of Tiina. Thank you for introducing me to the muffin top song. I’d totally forgotten that the most delicious part of the muffin is the top. Now I’m trying to reframe my thoughts about my belly and think of it as yummy fat. Wish me luck!